Attacking reservation elicits proverbs like ‘barking up the wrong tree’ or ‘throwing baby with the bathwater’ in my mind. 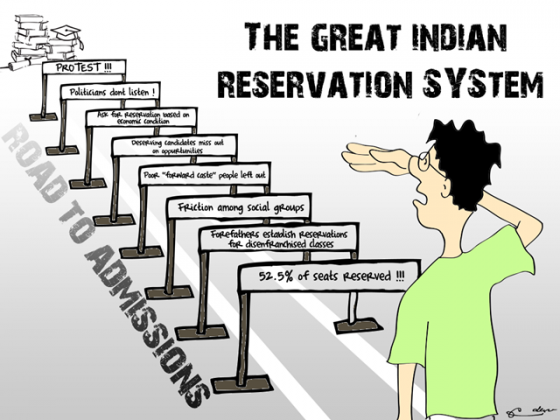 Reservation blocks almost 50% of a few thousands seats that are to be filled in educational institutes and Public Sector jobs, by affirmative action to historically socially and economically disadvantaged communities. Millions debate on daily basis how right or wrong this policy is, while passionately putting all forms of pointers in both favour and against it. I believe this discussion deviates us from the larger picture as it really does not affect most people in this country that what percentage of seats are getting reserved. All of the seats from which a certain section is reserved is just a drop in an ocean of unemployment. There is an unholy nexus of political-educational mafia which has, for the years, stalled a simple provision of ‘For-Profit-Education’ so as to preserve mediocrity and keep the existing framework of reservations in IITs, IIMs, government jobs, other reputed government institutions etc. relevant. Just to explain the point made above, the political class is funded by the black money generated by the education mafias who operate a string of low-quality and degree-stamping colleges and are actively involved in generating moolah from real estate too. These are the very people who also blatantly violates the existing provision of ’Not-for-Profit-Education’. However, a Harvard or a Tata University can’t function in this manner and therefore, would never involve themselves in entering education industry in the country and being uniformity, standards, quality, scale and better ROI for students. Same goes for industry where again India does not fare too well in ease of doing business, thus spooking off private businesses which keeps precious few public sector jobs relevant. So, the solution lies in addressing the entire public demand for education and jobs rather than manipulating supply of these. If that happens, since there will be a lot many MITs and BITSs competing in the league of IITs, there won’t be much hue and cry for the affirmative action that has been provided to certain communities to make sure they are also taken along in a rapidly growing and improving Education sector. This is what happens in USA, where despite having provisions of reservations for Afro-American communities a major chunk of University cities are filled by the best minds all over the world. And, they still are the best in education. Let’s take some cues from there and fix the right cause of the problem at hand.